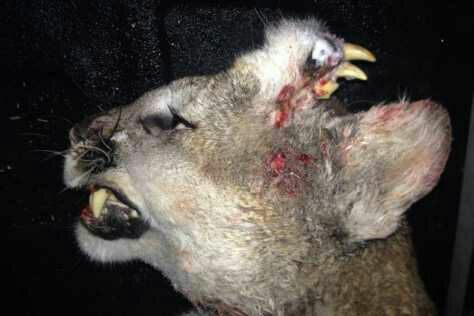 A group of hunters who pursued a Cougar, otherwise known as a mountain lion, in the US state of Idaho were shocked when they recovered the victim that they had shot dead, to discover that it had an extra set of teeth growing from its forehead. The animal was hunted down legally after it attacked a dog near the town of Weston, Idaho, although the dog survived that attack, people believed the mountain lion was dangerous so a hunter followed its tracks to where it ran off into the hills. Not to be outwitted by the big cat, the hunting party returned with hounds to find and kill it, when a conservation officer examined the body, which is required by State law, he found the set of teeth, as well as what appeared to be a set of whiskers on the left side of the animal’s forehead. In the state of Idaho, mountain lions are common, but they are very elusive, encounters with humans are very rare, but in winter, their prey species, such as deer and turkeys, move down from the mountains to escape colder temperatures, often gathering at the edges of villages or towns. Naturally this puts them into conflict with people, particularly those with livestock and the Idaho Department of Fish and Game have said that they can be legally hunted if people get a permit. The reason why this mountain lion had a set of extra teeth is unclear, but amongst a number of theories is that the extra teeth came from a twin that failed to develop properly but lived inside its sibling as a parasite, another is that it is the result of a tumour, but biologists claim never to have seen anything like it. We imagine that he hunter hasn’t either, but he will have a tale to tell for a few years at the bar, we imagine.